Ideal for casual entertaining. 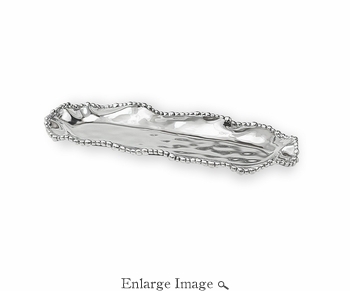 Our ORGANIC PEARL Brooklyn Small Oval Tray brings beauty and function to the table with its generous oval surface, and gleaming hand-polished finish. Edged with a cascading pearl-like border, the wavy indentations on the metal surface create a shimmering effect and enhance any setting. Great for serving a variety of foods. A brilliant gift for anyone who entertains in style. Made of an FDA safe, easy-care, oven and freezer friendly aluminum alloy.